Facebook is a major marketing platform, and each day it only grows bigger. The site allows companies and organizations to target certain types of individuals with advertisements, but how exactly does it achieve this? Keep reading to discover what Facebook knows about you and how it uses your personal information to create targeted ads. Virtually any company can create a Facebook advertisement page, and when they do, the platform allows them to select the exact type of customers they desire to target. When a person posts about a major life event such as a child’s birth, a marriage, or the purchase of a new home, the site uses the information to target these individuals with ads from companies who sell baby clothes or plan weddings. The site also keeps track of your “likes,” and it uses them to market to you. For example, if you “like” a certain landscaping company, Facebook will show you ads for other landscaping companies and companies who offer similar services. When users first create an account, they are prompted to input certain information about their age, location, and other aspects of their life. Individuals often enter employment and educational data, as well as data about their personal hobbies, political views, and sexual orientation. Companies perform extensive demographic research to learn about their customers, and if you fall into a demographic that may be interested in their products or services, they can target you through Facebook. Even if you are not currently visiting a website, Facebook can market to you using stored “cookies.” These cookies are used to keep track of any previous websites you may have browsed, and they allow companies to use them for marketing purposes. As mentioned above, when used properly, Facebook can be one of the most powerful marketing tools in existence. However, most companies need a bit of guidance when attempting to launch a social media marketing campaign. 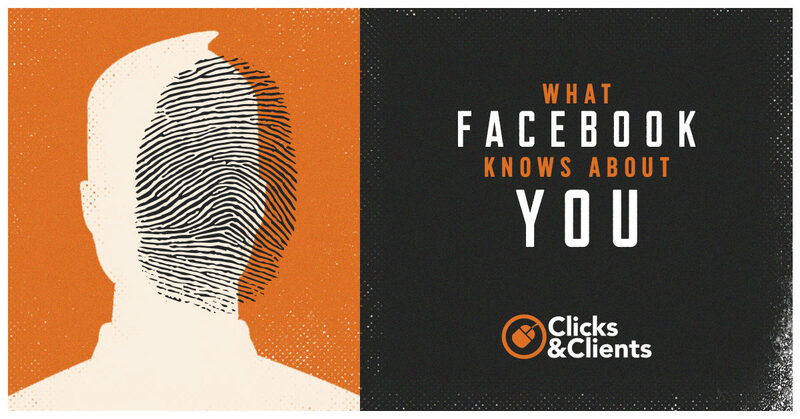 Place your discovery call to Clicks and Clients today to learn how Facebook can help you expand your customer base.